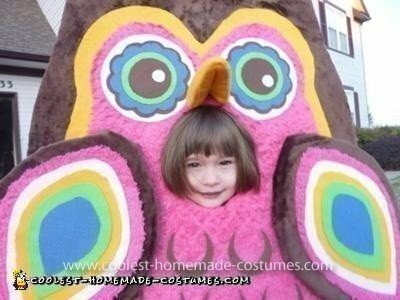 My daughter wanted to be an owl for Halloween, but I didn’t like any of the owl costumes I’d seen online, so I decided to make my own homemade owl costume. I’m an art director, so my computer skills are pretty good, but I have zero sewing skills. 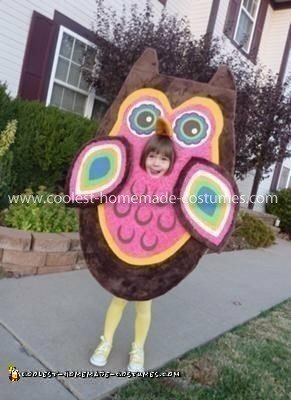 I figured out a way to make this no-sew, graphic, retro-looking, owl costume by using 1-inch upholstery foam, chenille & felt fabrics, and lots of fusible web material. I cut all of the foam pieces out, ironed fusible web to the fabrics, and then ironed the fabrics onto the upholstery foam. The foam pieces were then glued together with 3M Super 77 Spray Glue (love that stuff!). 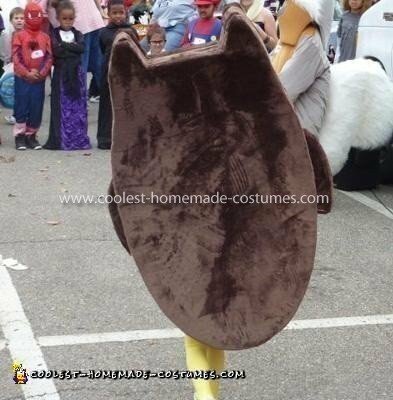 The sides were tied together with ribbon so that my daughter could get in an out of the owl costume like a sandwich board. And she dearly loved it, mostly because it was so soft inside & out. 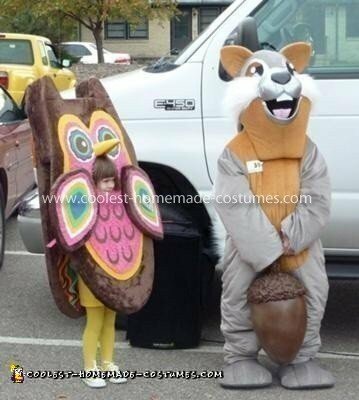 She was certainly a “hoot.” There was only one problem with the costume. She couldn’t reach her hands around the front of it to grab candy from the bowls when people offered it to her while trick-or-treating. But she managed anyway.